The players and occasion were not stated (apart from ‘Sept. 1912’). 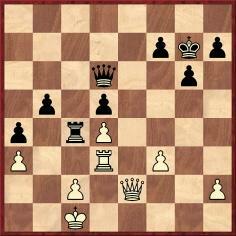 White won by 1 Ra1 d1(Q) 2 Ra7+ Kxb6 3 c8(N)+ Kc6 4 b5 mate. 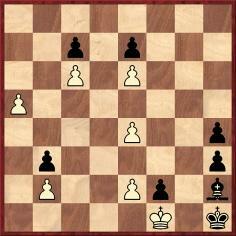 Black having just moved 63...Na6-c5, White played 64 b8(N), and the game was declared drawn. Source: Shakhmatny Byulletin, 1/1969, page 32. 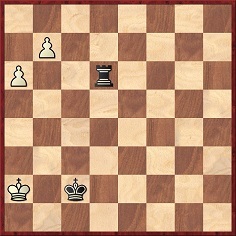 White played 74 f8(N) and won at move 87. Source: New in Chess, November 1985, page 57. 62 b8(N). 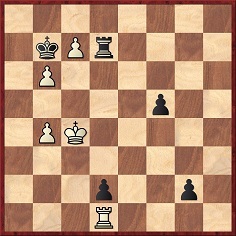 The game was won by Black at move 81. 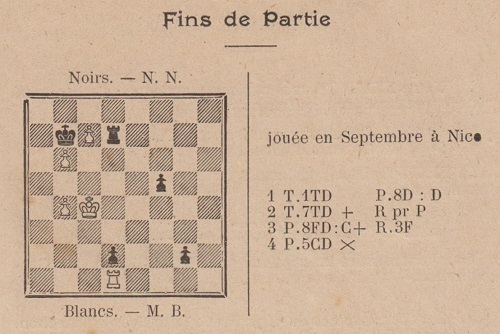 Source: Europe Echecs, November 1993, page 19-20. Regarding the first position in C.N. 2061 above (Vujić v Petrović, Yugoslav Ladies’ Championship, 1985), Emil Smilovici (Nepean, Ontario, Canada) asks whether the full game-score is available. 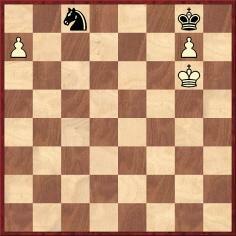 ‘and Black resigned; the next move would be mate’. 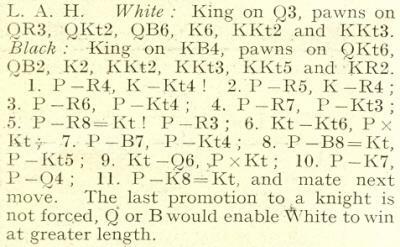 A large number of specimens of knight promotion without check were given by René Olthof in an article entitled ‘Silicon Curiosities’ on pages 80-83 of the 4/1994 New in Chess. 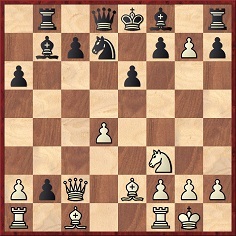 Play went: 1 Nxc4+ dxc4 2 Rd1 exd1(N) 3 Be4 Nxc3 4 Bxa8 Nxa2 5 Bd5 c3 6 Bxa2 c2 7 Bbl Drawn. The above was published on page 29 of issue 1 of the ‘Especial’ edition of Ocho x Ocho. We should like further details. 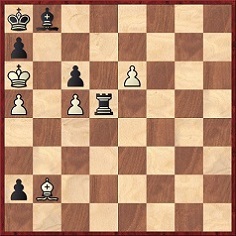 Jerky Konikowski (Dortmund, Germany) proposes an alternative way for White to draw in the above Palevich v Lebelt position: 1 Rxc4 e1(Q) (1...dxc4 2 Nxc4+ Ka4 3 Nb2+, followed by 4 Nd3.) 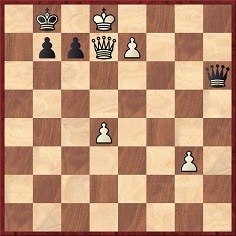 2 Rc5 Qe2 (against the threat of 3 Nc4+ and 4 Ra5 mate) 3 Nc4+ Qxc4 4 Ra5+ Qa4 5 Rxa4+ Kxa4 6 Kb2 Kb5. Solution: 1 e7 a1(Q) 2 Bxa1 Rd8 3 exd8(N) Be5 4 Nxc6 Bxa1 5 Nxa7 Bd4 6 Nc8 Bxc5 7 Nb6+ Bxb6 8 axb6 Kb8 9 b7 Kc7 10 Ka7 and wins. There followed 1…Qh8+ 2 e8(Q) Qf6+ Drawn. 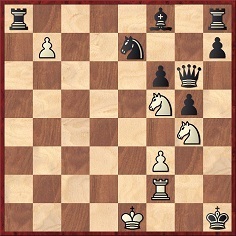 White could have won with 2 e8(N). Source: Tijdschrift van den Nederlandschen Schaakbond, December 1929, page 395. 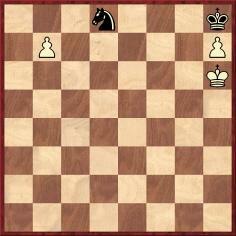 How does White mate in four moves from the position below? Solution: 1 c8(B) b3 2 Bg4 b2 3 Bd1 Kxb1 4 Bb3 mate. 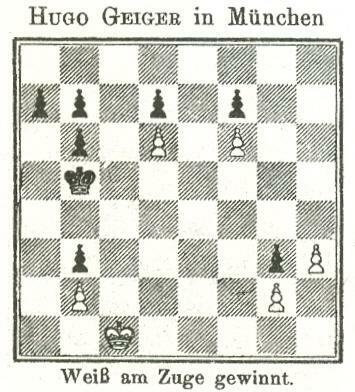 Source: CHESS, January 1953, page 65, which merely intimated that the problem had been published in Munich circa 1908 and did not identify the composer. The problem was by Oswald von Krobshofer (1883-1960) and, according to secondary sources, was published in the Münchener Neueste Nachrichten in 1908. Our thanks to Ivo Fasiori (Prato, Italy), Michael McDowell (Westcliff-on-sea, England) and Graeme Oswald (Chester-le-Street, England) for this information. 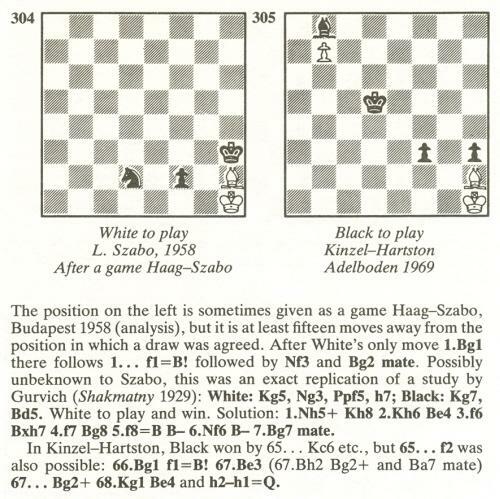 The above comes from page 186 of Chess Curiosities by Tim Krabbé, and Claus van de Vlierd (Oldenburg, Germany) asks whether the full game-score is available. 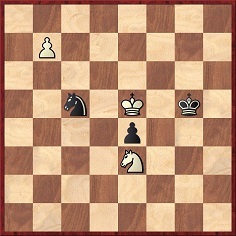 This position (White to move) was given on pages 262-263 of Combination in Chess by G. Négyesy and J. Hegyi (Budapest, 1965). 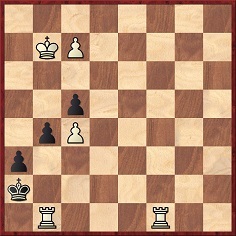 It is described as ‘a possible subvariation’ from the game Haág v L. Szabó, Budapest, 1958, and the moves indicated are 1 Bg1 f1(B), and Black wins. Is anything more known about the game’s conclusion? 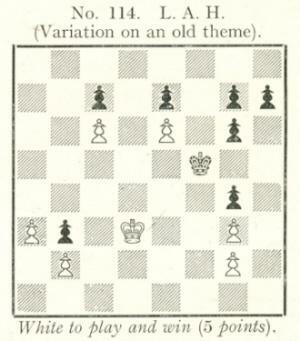 Michael McDowell points out that a miniature study by S.G.Belokon quoted on page 310 of Test Tube Chess by A.J. 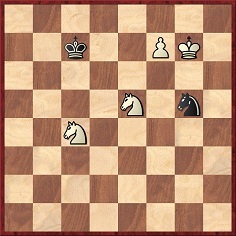 Roycroft (London, 1972) shows promotion to both knight and bishop and the same finish as in the Szabó position. 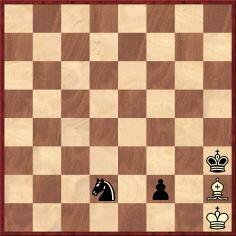 1 a6 Bg1 2 a7 h2 3 a8(N) h3 4 Nb6 cxb6 5 c7 b5 6 c8(N) b4 7 Nd6 exd6 8 e7 d5 9 e8(Q) and wins. 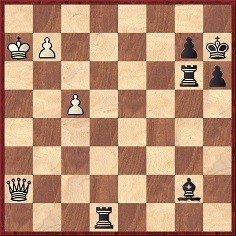 1 h4 Ka5 2 h5 Ka4 3 h6 b4 4 h7 b5 5 h8(N) a5 6 Ng6 fxg6 7 f7 g5 8 f8(N) g4 9 Ne6 dxe6 10 d7 e5 11 d8(N) and wins. ‘It is unclear when this study was made. In the database it has been adorned with the label “source unknown”. The main historical issue raised by Timman is whether Sigmund Herland was the first to compose such a study, in 1913, or whether the Fritz position antedated it. We offer some jottings. The Herland study was published on page 128 of the 6 April 1913 Deutsches Wochenschach, with the solution on page 247 of the 13 July 1913 issue. 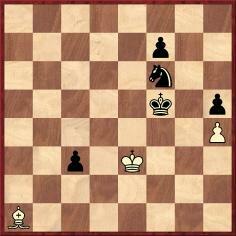 As regards the ‘fatal flaw’, the key point is whether the white king is on b1 or c1. 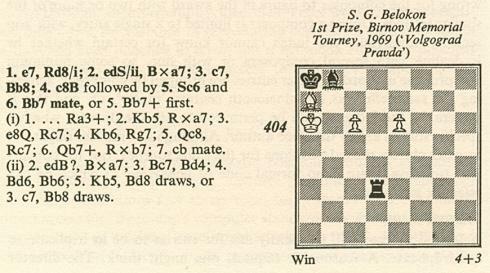 The van der Heijden database has both versions, but who first proposed the improvement of placing the king on b1? Harold van der Heijden (Deventer, the Netherlands) answers the question in C.N. 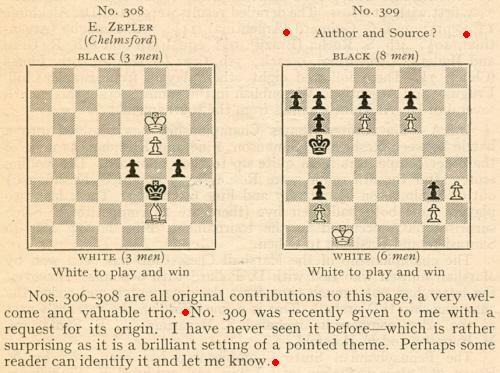 7418 about who proposed the improvement (white king on b1, and not c1) in this study from page 38 of the February 1920 Deutsche Schachzeitung: Mikhail Zinar (Ukraine), on page 137 of a book co-written with Vladimir Archakov: Гармония Пешечного Этюда (Kiev, 1990). 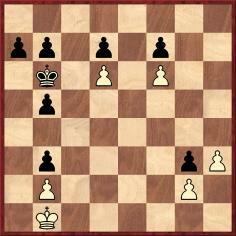 White wins with 1 b8(B). If 1 b8(N) Nf7+ 2 Kg6 Ng5. 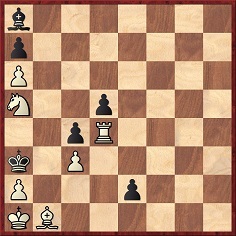 Again, promoting to a bishop is the only winning move, although the defenses are different (beginning with 1...Ne7+ 2 Kf6 Kh7). 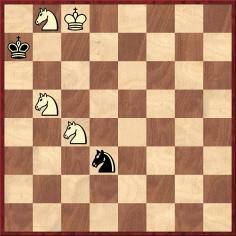 Regarding the famous Saavedra position, see pages 34-35 of Kings, Commoners and Knaves and C.N. 5796. Latest update: 25 December 2018.